"Sampath Speaking" - the thoughts of an Insurer from Thiruvallikkeni: Russel Mania and ............. Sehwag's golden duck .... T. Sampath who ?? Russel Mania and ............. Sehwag's golden duck .... T. Sampath who ?? I am none too pleased when my son watches and enjoys ‘Wrestle Mania’ a professional (!) wrestling promotion based in Connecticut. WWE first produced the event in 1985 to be its premier annual event and has since produced thirty editions, with the thirty-first scheduled to be held in Santa Clara, California in 2015…… yesterday, a slightly mispronounced one – I sat to enjoy with my son …………. It was ‘Russel Mania’ – the Jamaican Andre Dwayne Russel who has played a solitary Test for Windies was the hero. CL T20 is providing great entertainment even when you see players like – Anureet Singh and Karanveer Singh in action, whom you may not have heard before. Earlier, the absence of two high-profile Twenty20 cricketers hamstrung Sri Lanka's Southern Express as they made an early exit. Southern Express lost all three matches of the qualifying group - to Northern Districts (from New Zealand), Mumbai Indians and Lahore Lions (Pakistan) - to make an early exit from the tournament. While Malinga chose to play for MI, Dilshan’s absence had its impact. In the lungopener between CSK and KKR – the 18th over was a maiden it was Sunil Narine who flummoxed Bravo – eventually finishing with 4-0-9-1 dream figures in T20. The last ball of Umesh Yadav went up, up and upper, landing in the upper tier beyond wide long-on mightily struck by Dhoni. The target was not big but those of us following the game know KKR’s fragility. Ashish Nehra took two in two to leave Knight Riders gasping at 10 for 2. Then came the help from the Umpire. … Mohit Sharma then began his run-up to start the third over; Dhoni stopped him bringing in Ishwar Pandey. 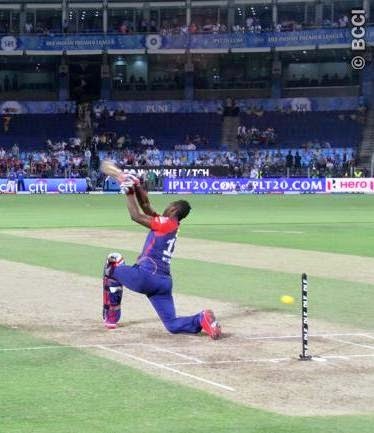 The umpire stepped in to say that Mohit would have to continue, having begun his run-up - Yusuf Pathan poked at an outswinger and another wicket….. 10/3 …. After 10 overs, chasing 158 - Knight Riders lurched haplessly to 21 for 4. Ashish Nehra took three of those wickets, including two off two in the third over. Soon, Suryakumar Yadav was gone and Knight Riders were 51 for 5. If one thought that the match was one-sided……….. Russel had other ideas – as he and Ryan ten Doeschate pulled off a heist. Knight Riders went into the last 10 overs needing 98 runs; they won with an over to spare. Russel’s 50 came off just 21 deliveries. Today, Thisara Perera made his Kings XI Punjab debut as they chose to bowl against Hobart Hurricanes. With a rib injury ruling Mitchell Johnson out, Perera joined Kings XI regulars Glenn Maxwell, David Miller and the captain George Bailey in the team. Hobart were restricted to 144 – shoaib Malik did not score much and chasing………… Virender Sehwag made a golden duck.